As a young adult, I found the idea of eating raw meat a bit repulsive, until I tasted a Steak Tartare at a “bouchon” in Lyon with all the right seasonings… from that moment, there was no coming back. I’d been craving Steak Tartare for a while, so I ordered the entree-sized option. It was still pretty generous, and I struggled to finish it. It was topped with a quail egg yolk still in half a shell and poured on the steak by the waitress. It also came with thin and crispy bread slices and sweet potato crisps, as well as fried little capers on the side. It hit the spot. My friend ordered 100g of King crab leg, which came with a bit of mayonnaise/aioli type of sauce and she seemed pretty delighted. 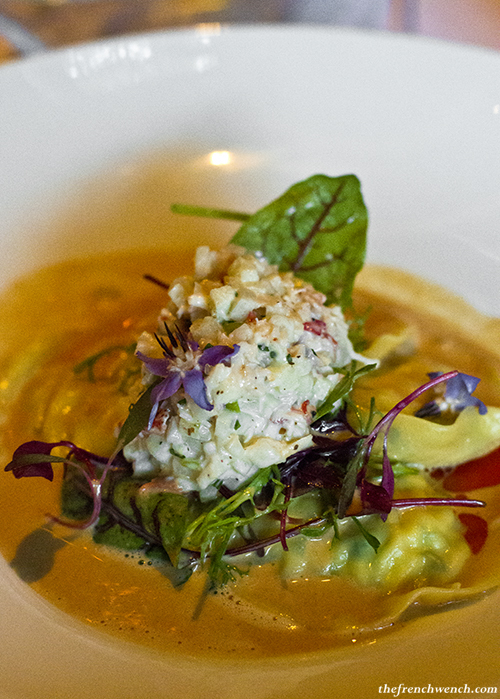 I chose the Lobster Ravioli as a main, and I didn’t regret it. 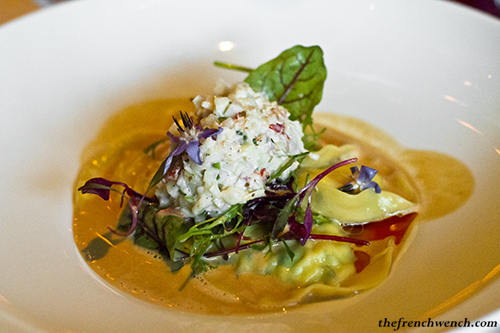 The waitress poured the bisque at the table on the ravioli, which were served on a bed of confit tomato. The ravioli were topped with a “salad”, consisting of diced poached lobster tail meat, diced fresh green apple, diced baby fennel blanched diced celeriac, truffle aioli, chopped chives, lemon juice. 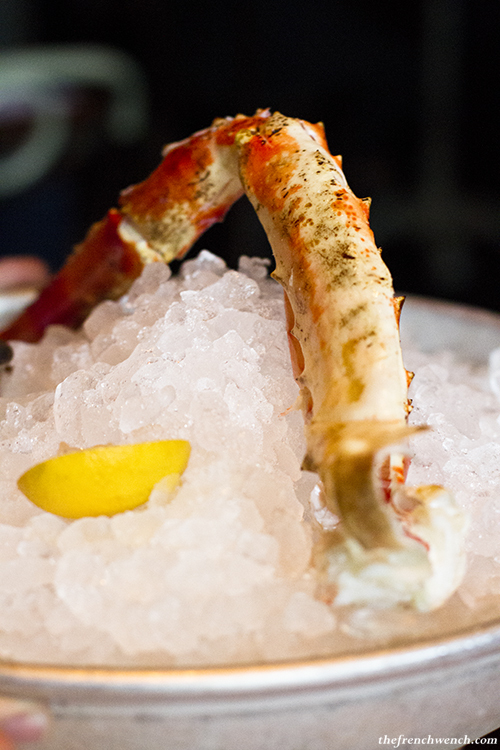 It was light, refreshing and had loads of flavour… I would order it again in a jiffy! 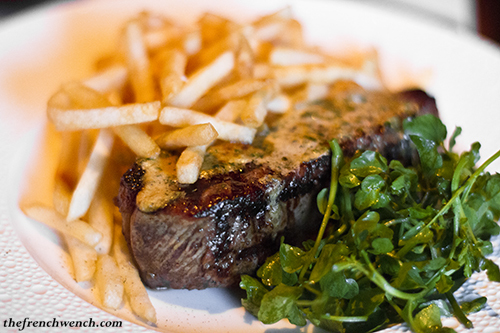 My friend had been dreaming of a Steak-Frites for weeks now, and her dream came true in the shape of the 300g Grass-fed sirloin, which she found delicious. I was a bit worried as I’d read that the restaurant could get a bit too enthusiastic with the house music. 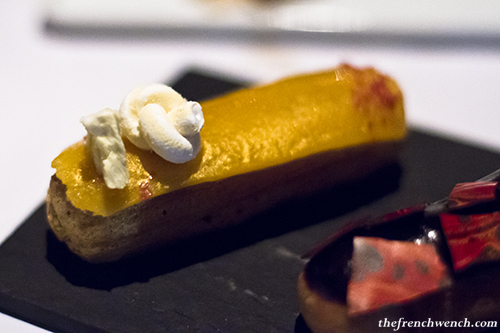 At first I didn’t find it that bad, but by the end of the meal, as the light kept on being dimmed, the music kept on getting turned up… But that was fine, as we were in the last phase of our dinner by then, the much-anticipated desserts! 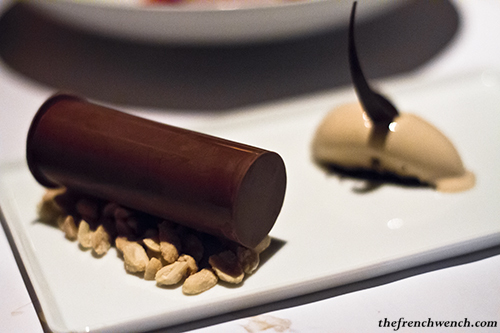 The girls were quite disappointed to find out that the Chocolate Fondant was no longer on the menu, being less suited to summer, so they consoled themselves by ordering the Snickers’s Revolution, a deconstructed Snicker Bar consisting of peanut ice-cream, a tube of chocolate filled with a chocolate mousse on a bed of peanuts. (Sorry if I sound wanky using the expression “on a bed of”, but… I really can’t think of a better one.) And my friends loved the dessert. 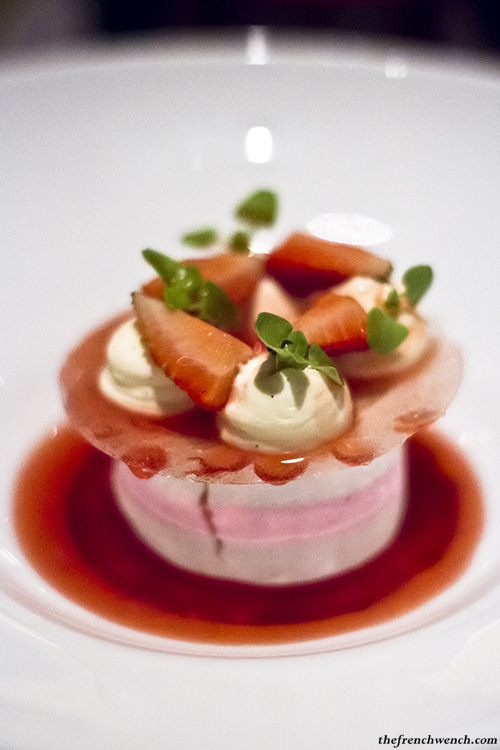 This beautiful dessert of Strawberry & Cream consisted in a Meringue cylinder topped with a sugar disc, on which dollops of cream and fresh strawberries were placed. The waiter then poured a strawberry coulis at the table. A very classic combination of flavours, but a winning one: fruity, light and refreshing. The moment finally came to taste the famous eclairs: I would have just ordered the salted caramel eclair if I could have, but the menu only listed the Trio of Eclairs as an option. I started with the Pineapple (Ananas): the taste of the fruit was really distinct and intense, it didn’t taste artificial, and I liked the little marshmallow on top. 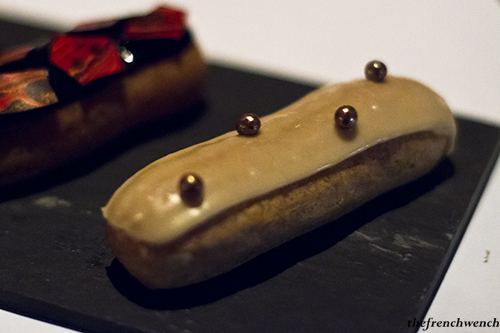 The 2nd eclair, Jaffa, was made of chocolate and orange blossom. I had never tasted the eponymous lollies, so didn’t have a preconceived idea of how it should taste… I only know it tasted damn good! But my favourite was really the Salted caramel one: the filling was very smooth, creamy and not too set, but not too runny either, a good balance of sweet and salty… parfait. 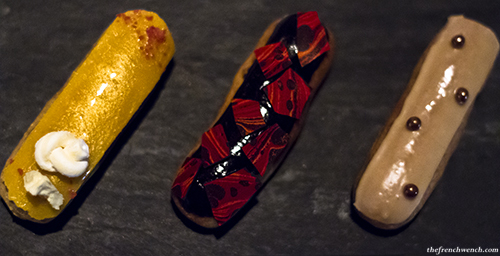 I actually heard on the grapevine that an Eclair store might soon see the light of day in the Ananas vicinity in the next few months… so stay tuned, as Eclairs are the next big thing! Despite the 2-hour sitting policy, we didn’t feel any pressure to leave after exceeding our allotted time, which was most appreciated, as I hate feeling rushed. Brasserie Ananas offers great food, pleasant service (mostly French), and despite not being on the cheaper side of the bistro/brasserie spectrum, is perfect to celebrate special occasions and is sure to appeal to all Francophiles and French food lovers out there. 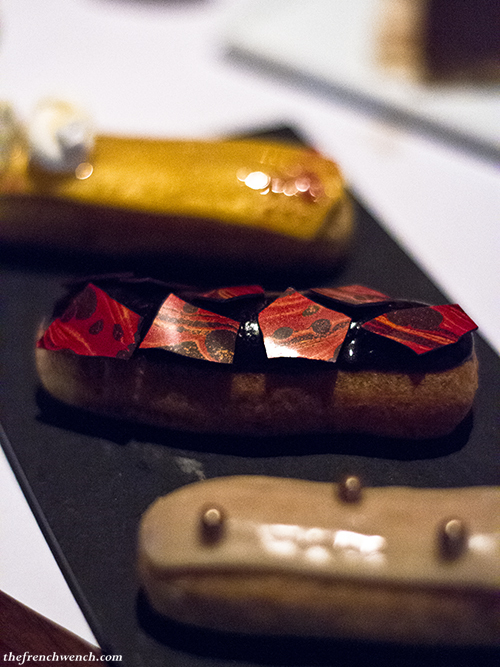 This entry was posted in Restaurants and tagged Ananas, Eclair, pastry, patisserie, The Rocks. Bookmark the permalink. Wow it all looks so good. 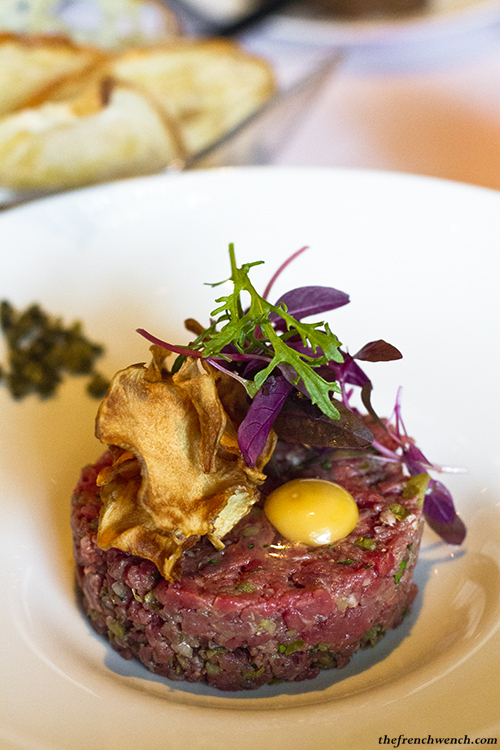 I love steak tartare and this one looks so refined and elegant! The desserts look amazing too.